Fax command set software provides a general purpose command set controller (CSC) with options for developers to support features available with many command sets as well as to create custom command sets for specific applications. These features include facsimile control (known as fax command sets class 1, 1.0, 2, 2.0 and 2.1), speech/audio coder control, speakerphone control, data modem control, caller ID, low-level multimedia control (V.80), V.8/V.8bis startup procedure control (V.251). Contact us for a demo. VOCAL’s fax command set software is optimized for DSPs and RISC/CISC processors from ADI, TI, Intel, ARM and other leading vendors. Our fax software may be licensed as a standalone algorithm or library. Custom designs are also available to meet your specific requirments. VOCAL’s facsimile service class 1 command sets (EIA-578 and T.31) can be used to control all of the facsimile modulations and data streams. 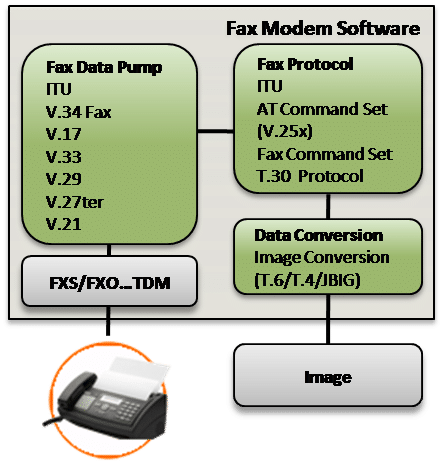 In addition, VOCAL’s facsimile service class 2 command sets such as T.32 (known as fax class 2.1), EIA-592 (known as fax class 2.0) and industry standard (known as fax class 2) can be used to control T.30 functions. General purpose non-volatile memory support – customizable for various system configurations (E2, file system based, Windows 95/NT registry, intranet). Time Independent Escape Sequence (TIES) for data modes. Command Set Parse Tables available for V.80, V.250 (V.25ter), EIA-615, facsimile, IS-101, industry standard, others. Optional V.8/V.8bis support by command set (V.251) or inherent to CSC configuration. Low overhead buffering and flow control mechanisms. DTE interface can be hardware, device driver, LAN/WAN data channel. Compatible with VOCAL’s Overall Modem Controller (OMC) Layer. Command set controller layer (with or without OMC) can reside within a Windows 95/NT VxD device driver. Optional feature supports voice command sets (V.253, IS-101). Optional feature supports DTMF detection during voice modes (V.253, IS-101). Optional features support North American and International dialing and procedures (Hook control, DTMF/Pulse Dialing, Call Progress Monitoring, DAA control). Call Progress includes monitoring for Primary/Secondary Dialtone, Busy, Congestion, Bong. Facsimile service class 1 features – commonly referenced as fax class 1 (T.31, EIA-578). Facsimile service class 2 features – commonly referenced as fax class 2 and fax class 2.0/2.1 (T.32, EIA-592, IS-134). Support for Data/Facsimile/Voice distinction available. Telephony features such as caller ID, DTMF detectors, full duplex speakerphone, call progress detectors available (V.252, EIA-602, IS-101, industry standard).